Arctic News: A Global Temperature Rise Of More than Ten Degrees Celsius By 2026? Additional warming was caused by humans before 1900. Accordingly, the next (light blue) element from the top down uses 0.3°C warming to reflect anthropogenic warming from pre-industrial levels to the year 1900. 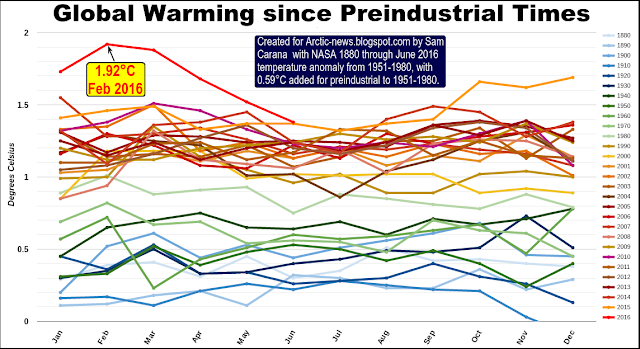 When also taking this warming into account, then it was 1.92°C (3.46°F) warmer in February 2016 than in pre-industrial times, as is also illustrated on the image below. With dramatic cuts in emissions, there will also be a dramatic fall in aerosols that currently mask the full warming of greenhouse gases. From 1850 to 2010, anthropogenic aerosols brought about a decrease of ∼2.53 K, says a recent paper. While on the one hand not all of the aerosols masking effect may be removed over the next ten years, there now are a lot more aerosols than in 2010. A 2.5°C warming due to removal of part of the aerosols masking effect therefore seems well possible by the year 2026. Warming due to Arctic snow and ice loss may well exceed 2 W per square meter, i.e. it could more than double the net warming now caused by all emissions by people of the world, calculated Professor Peter Wadhams in 2012. A 1.6°C warming due to albedo changes (i.e. decline of both Arctic sea ice and snow and ice cover on land) therefore seems well possible by the year 2026. ". . we consider release of up to 50 Gt of predicted amount of hydrate storage as highly possible for abrupt release at any time," Dr. Natalia Shakhova et al. wrote in a paper presented at EGU General Assembly 2008. Authors found that such a release would cause 1.3°C warming by 2100. Note that such warming from an extra 50 Gt of methane seems conservative when considering that there now is only some 5 Gt of methane in the atmosphere, and over a period of ten years this 5 Gt is already responsible for more warming than all the carbon dioxide emitted by people since the start of the industrial revolution. Professor Peter Wadhams co-authored a study that calculated that methane release from the seafloor of the Arctic Ocean could yield 0.6°C warming of the planet in 5 years (see video at earlier post). In conclusion, as temperatures keep rising, a 1.1°C warming due to methane releases from clathrates at the seafloor of the world's oceans seems well possible by the year 2026. Rising temperatures will result in more water vapor in the atmosphere (7% more water vapor for every 1°C warming), further amplifying warming, since water vapor is a potent greenhouse gas. Extra water vapor will result from warming due to the above-mentioned albedo changes in the Arctic and methane releases from the seafloor that could strike within years and could result in huge warming in addition to the warming that is already there now. As the IPCC says: "Water vapour feedback acting alone approximately doubles the warming from what it would be for fixed water vapour. Furthermore, water vapour feedback acts to amplify other feedbacks in models, such as cloud feedback and ice albedo feedback. If cloud feedback is strongly positive, the water vapour feedback can lead to 3.5 times as much warming as would be the case if water vapour concentration were held fixed", according to the IPCC. Given a possible additional warming of 2.7°C due to just two elements, i.e. 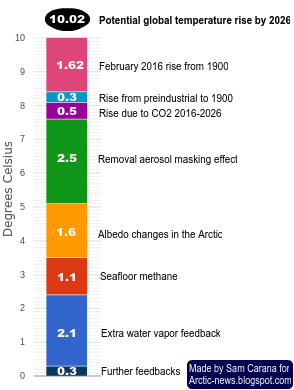 Arctic albedo changes and seafloor methane, an additional warming over the next decade of 2.1°C due to extra water vapor in the atmosphere therefore does seem well possible by the year 2026. Further feedbacks will result from interactions between the above elements. Additional water vapor in the atmosphere and extra energy trapped in the atmosphere will result in more intense storms and precipitation, flooding and lightning. Flooding can cause rapid decomposition of vegetation, resulting in strong methane releases. Furthermore, plumes above the anvils of severe storms can bring water vapor up into the stratosphere, contributing to the formation of cirrus clouds that trap a lot of heat that would otherwise be radiated away, from Earth into space. The number of lightning strikes can be expected to increase by about 12% for every 1°C of rise in global average air temperature. At 3-8 miles height, during the summer months, lightning activity increases NOx by as much as 90% and ozone by more than 30%. The combination of higher temperatures and more lightning will also cause more wildfires, resulting in emissions such as of methane and carbon monoxide. Ozone acts as a direct greenhouse gas, while ozone and carbon monoxide can both act to extend the lifetime of methane. Such feedbacks may well result in an additional 0.3°C warming by the year 2026. Adding up all the warming associated with the above elements results in a total potential global temperature rise (land and ocean) of more than than 10°C or 18°F within a decade, i.e. by 2026. As said before, this scenario assumes that no geoengineering will take place over the next decade. Thank you for being close to the truth. 1.96 C over 1750, we have zero carbon budget and did not have any once we passed thru 350 CO2. Well written and clear we are now in runaway. Thermodynamic laws, in my estimation absolutely mean entropy rise by our hand as long as we allow debt based pecuniary system isolation world drive on a planet that evolved with Open Systems of Nature large for equilibrium.. Zeroth Law of three bodies in equilibrium is compromised. Speed of event and scale and local of change needed to reverse this is, well it is a worthy challenge enough to trigger use of Act of God to Not, That's in my opinion a kindness to others to try with necessity. This would/will be 'hell' on earth!